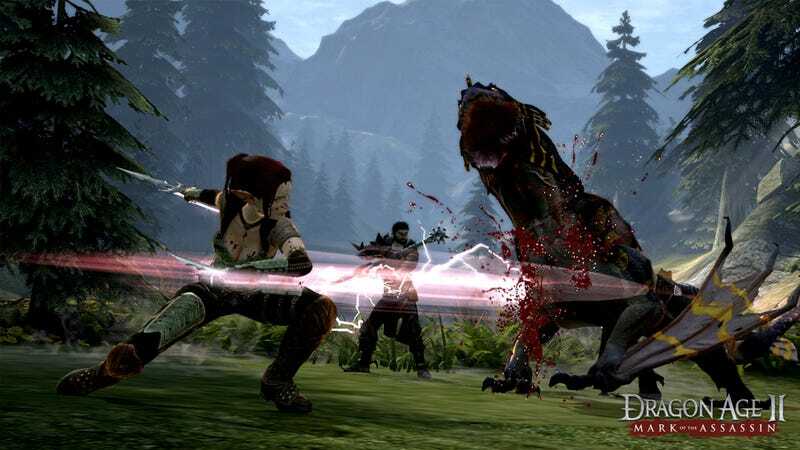 Ripped from the trailer for Dragon Age II's Mark of the Assassin downloadable content, two screenshots of a blood-splattered Felicia Day in action and a picture of a courtyard. Man, courtyards are so hot. Of course I'd rather show you some screenshots that aren't pulled directly from a trailer, but BioWare is a busy company that's laser-focused on creating games like Mass Effect 3, The Old Republic, and a better Dragon Age than number II. We're lucky we got a trailer. You'll eat your screenshots and you'll love them!